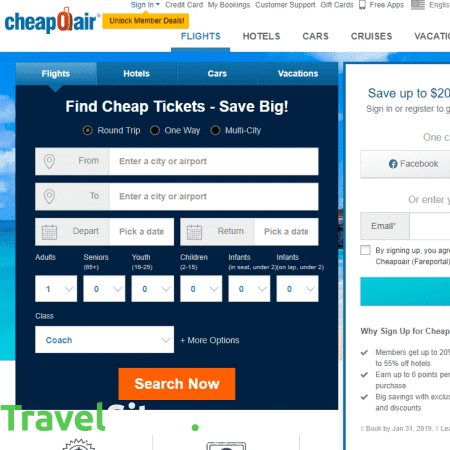 Despite its rather off-putting name, CheapOair is a very practical website for booking flights online. With an easy to use mobile application, plentiful filters to narrow searches and a ‘Live Help’ chat, the website is one of the best out there in making what is often a stressful experience into a more relaxed one. Rather than merely offering ‘Adults’ and ‘Children’, on the homepage you also can select from a wide range of age groups, including Senior Citizens, ‘Infants on Seat, under 2’ and ‘Infants on Lap, under 2’, allowing for potentially cheaper airfares than on other sites. On one flight that I browsed, you could save up to $40 USD on a return journey by differentiating between ‘on Seat’ and ‘on Lap’, therefore a useful thing to know if travelling with children. Like their competitor Kayak, CheapOair offers the ability to sign up to their email notifications system, which send alerts when prices change on flights you’re interested in. This means that if you’re booking flights well in advance, you can wait for the cost to drop before making the purchase, all without having to continually check up on it yourself. Similarly, they also offer flexible dates, which include flights three days before or after your travel dates. However, one aspect of the website that I wasn’t happy with was the processing fee that they attach to each passenger ticket, as well as a significant cancellation fee that can sometimes exceed the original cost of the booking. Although in some cases you can get this fee waived by cancelling over the phone, it’s something to watch out for if you when using CheapOair if you are not 100% about sure about travel arrangements. That being said, their ‘Featured Offers’ and price match guarantee make them a good choice for purchasing airfares.